No wonder these Lords are so loyal to Brussels... They are being paid MILLIONS by the EU! The EU forks out over £500,000 a year in pensions to 30 former MEPs and officials in the Lords. They include seven ex-European Commissioners who swore an oath of loyalty to Brussels, this means they risk losing all their pension if they attack their old institutions. Former EU Commission vice-president and ex-Labour leader, Lord Kinnock receives a £87k annual pension from the EU. Lord Patten receives an estimated £3,800 for his five years as a commissioner. Lord Tugendhat, commissioner from 1977 to 1981, has an estimated pension of £41,000 a year. Former EU Trade Commissioner Lord Mandelson is due to receive a pension of £34,600 a year. 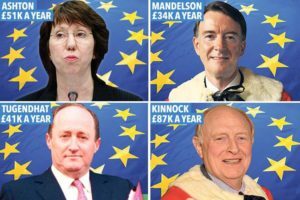 Others who swore the EU oath are Baroness Ashton and Labour pair Lord Clinton-Davis and Lord Richard, with a combined EU pension payment of £90,000 a year. Many of the other EU pension recipients are also highly vocal Remainers who are trying to undermine the result of the Referendum. Do you agree we should scrap the House of Lords/ Leeches now? Read: "Commons speaker John Bercow outed as serial BULLY!" Read: "Secret plans for EU Army revealed!"